After 8 days at sea level, it was very hard to acclimatize to the altitude again. We arrived back from the Galapagos Islands to Quito on Tuesday night. Quito is located at around 2800 m and Wednesday we went up to Ruco Pichincha at 4696 m to speed up the acclimatization a bit. To get to Ruco Pichincha we were ‘wooshed’ up to 4100 m by the Teleferico (the cable car) and from there we walked to the top. Our bodies were in shock! Our hearts were galloping and we were breathing like two steam locomotives. Malene especially started feeling nausea at around 4650 m with rubber legs and headache….and we were planning to climb Aconcagua! How were we even going to manage Cotopaxi at 5897 m! Thursday we left Quito and drove to Los Illinizas national park where we arranged for a guide to climb the Illiniza Norte. Recently 3 climbers died on Illiniza Sur so it is now required to have a guide, also for the much less technical Illiniza Norte. We went to sleep at the trail head parking lot at 3950 m altitude. It was beautiful with lots of stars and the quiet company of 7 cows. Our guide, Fausto, arrived early the next morning (Friday) at 06.30 and we started walking slowly up the trail. It was not so easy to keep the speed down as slow as we wanted and we realized why when Fausto told us that he was born at 3800 m and when he was a child he was herding the animals and playing football at 4200 m altitude. So Fausto walked the whole way to the top at 5126 m with his hands in his pockets while we were making a big effort for every 100 m more! 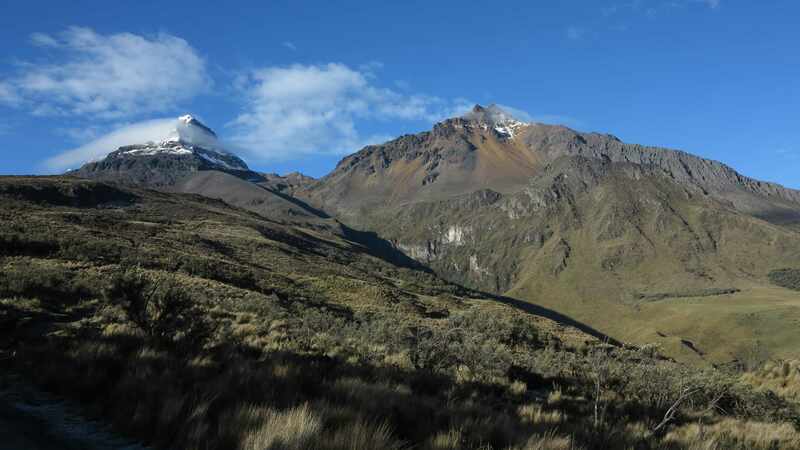 At 4700 m, Malene was struggling again with the altitude and more than anything struggling with the fear of feeling like on Ruco Pichincha, the fear of not reaching the top of Illiniza Norte and thereby not being able to climb Cotopaxi! It was like a domino effect of possible disasters in the brain. Illiniza Norte was becoming a psychological Everest and slowly-slowly we conquered it and made it to the top at 5126 m! It was a new altitude record for both of us of compared to the 5000 m we reached on Peak Talgar but it was in principle a much bigger victory. Now we were ready for the 5897 m high Cotopaxi! We were down again at the parking lot at one o’clock in the afternoon and after a good lunch at Bladimir’s hut, we continued to the Cotopaxi National Park where we slept at the Hostaria Tambopaxi (3800 m) at the foot of the impressive Cotopaxi stratovolcano. Saturday mid day we drove up to the high parking lot at 4600 m and hiked up to the hut at 4800 m. We arrived quite early in the afternoon so after getting our beds assigned we hiked up to 5150 m to gain a bit more altitude. We sat and enjoyed the view at the foot of the glacier, one of the few glaciers located on the equator. The hut was quite basic, dirty and full of people so it was better to stay outside as much as possible. At 6 pm we had dinner and then we went to bed to rest a little bit before the wake-up call at 11 pm. The Cotopaxi stratovolcano seen from the Tambopaxi Lodge. At midnight we were ready to go. The night was mild, quiet and full of stars. We slowly climbed the rocky slope until we jumped on the glacier at 5200 m. On the lower part of the glacier we had to traverse several deep crevasses and walked through impressive crevasse fields, which we could just make out in the light of our head lamps. At 1 o’clock we had passed 5150 m above sea level and the rest of the night we made personal altitude record for every new step up. It was hard! And it got incredibly steep!! In the darkness we could not see the way forward, but we could see our guide Jaime continuing up-up-up in front and above us. There were a few flat sections but then again the light of Jaime’s headlamp started climbing up ahead. It took us 6 hours to reach the top. It is impossible to describe the feeling of finally standing on the crater rim at 5897 m, watching the sun rise in the east and looking down into the steep, dark crater of Cotopaxi with a faint smell of sulphuric gasses tickling the nose. 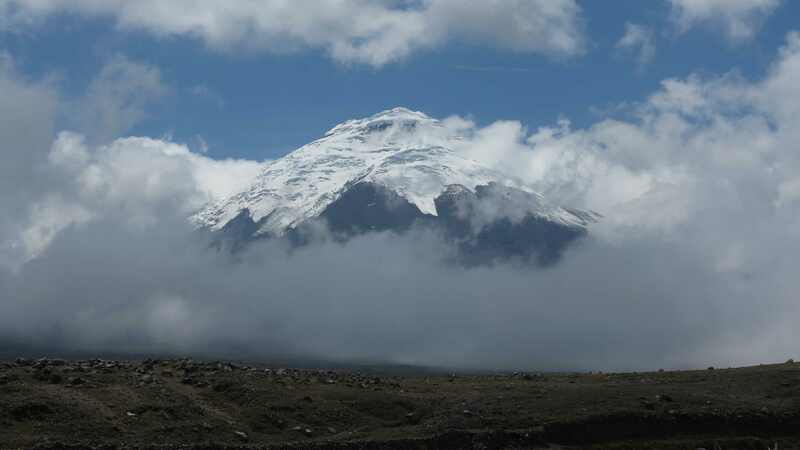 To the southwest we could see the large ice covered peak of Chimborazo rising above the clouds, the highest point in Ecuador, to the west the two Illinizas, Sur and Norte, and to the northeast the beautiful ice covered volcanic peaks of Cayambe and Antesana. 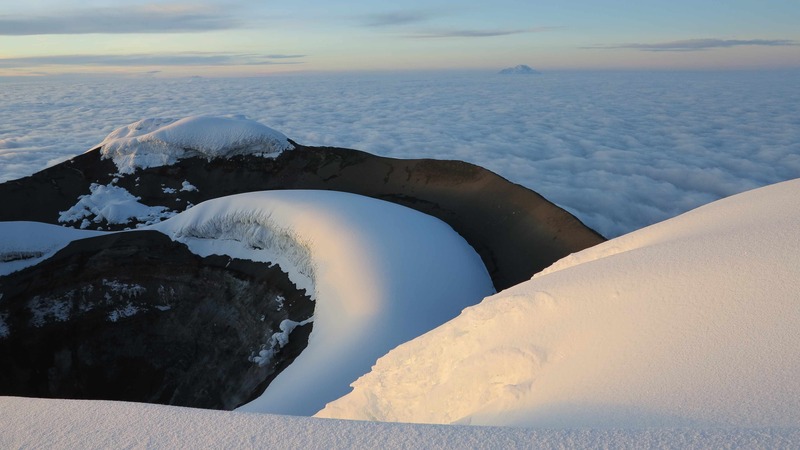 On the rim of the steep Cotopaxi crater – note Chimborazo towering above the clouds in the background. It is incredible how completely different it is to climb mountains at high altitude. It is a psychological battle more than a physical exercise. Unless you are brilliantly acclimatized you will feel the not so pleasant effects of the altitude. When the nausea begins you will have to convince yourself that it is not real, that it is not relevant to you and that it will go away. If you fight the nausea like it is something real happening to your body, then you have lost the battle. But once you win the psychological game over your brain and convince yourself that the nausea does not exist, the incredible thing happens that it goes away and you are free to continue to the peak. It happened on Cotopaxi and it is a crucial bit of experience for continuing to higher altitude. Let’s hope that we will have both the psychological and physical strength for climbing Aconcagua in January!